e) had the Force’s first munity under his command. Arthur Henry Griesbach born was October 22, 1839 at Yorkshire England. His father was an Anglican clergyman. Arthur was the third of ten children. His two older brothers had died while serving in the British Army. At the age of 18, he received an officer commission in the Yorkshire militia regiment then transferring to the 15th (the King’s) Hussars where he rose to the rank of Captain. In later years, he also served as a Captain in the Cape Town Rifle regiment. In 1870, Arthur Griesbach was a member of the General Wolseley expedition during the Red River Rebellion in Manitoba. In this expedition, he was a British Army Captain and Quartermaster. While the turmoil on the Red River Rebellion were drawing to a close. The new Canadian government was concerned about re-establishing of peaceful, law-abidding communities and an appropriate administration in the North West Territories. The concept of establishing a police presence in the North West Territories was that of John A. MacDonald. His recommendation was forwarded to Privy Council on April 6, 1870. Based on the Privy Council submission, Captain Donald Roderick Cameron (had served as a staff officer in India and as adjutant of the Royal Artillery in Halifax) was tasked to research and develop preparation plans for the creation of a territorial policing force. He was assisted by Arthur Griesbach. Their work outlined a self-sustaining organization which was based on a military regiment model. Under these initial plans, Captain Cameron was to become the commandant of this new territorial police force but the proposal for this organization and appointment didn’t materialize. Consequently, Cameron went on to become the Canadian Commissioner of the Boundary Survey. After completing the research work with Captain Cameron, Arthur Griesbach secured a position as Sergeant Instructor with “A” Battery of the Royal Canadian Artillery stationed at Kingston, Ontario. On August 30,1873, an order-in-council was issued authorizing the creation of the North-west Mounted Police. Apparently on September 1, 1873, Arthur Griesbach was offered and accepted a position as a Chief Constable in the new territorial force. His appointment was appropriate because he was one of the architects who developed the original territorial force plan submitted to the Canadian government. It was the content of this original plan that was used to develop the legislation authorizing the creation of this new organization. Hussars and Cape Town Rifles). On October 16, 1873, Lieutenant-Colonel George A. French (British Officer serving in Canada) was appointed as the first Commissioner of the North-west Mounted Police. 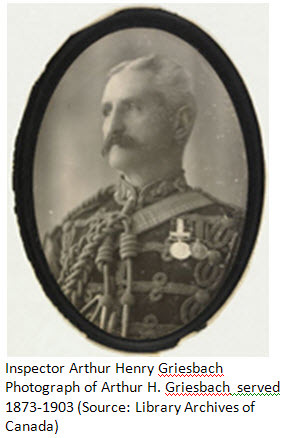 Prior to this appointment, he was the Inspector of Artillery and Warlike Stores and Commandant of the School of Gunnery at Kingston Ontario. It is interesting to note that Arthur Griesbach was also stationed in Kingston Ontario and attached to “A” Battery of the Royal Canadian Artillery. Obviously, both Arthur and George were aware of each other prior to both becoming members of the North-west Mounted Police. On November 3, 1873, the enlistment oath was administered by the acting Commissioner. Each man was given a warrant bearing his name and rank. The first three individuals to sign the roll were – Arthur Griesbach then Percy R. Neale followed by Samuel B. Steele. Each of these members were appointed as Chief Constables which is equivalent to a Sergeant Major. Sam Steele coordinated the breaking-in of horses and instructed the officers and men on riding. Based on his past experiences, Percy Neale took over the role as the Quartermaster and coordinated the logistics of organizing kit, clothing and supplies. In March 1875 at Dufferin Barracks– Arthur wrote a letter to Commissioner French complaining about the vague promises that he was made when enlisting into the Force. One of his complaints was being required to share a tent with non-commissioned members – the same individuals he has to administer discipline upon. Another vague comment made to him was that promotions within the new police force would be based on merit and promotions would be within the ranks of this new force. On the famous March West, Arthur Griesbach was the Regimental Sergeant Major. In later years, he was posted to Fort Saskatchewan where he remained for most of his career. On February 15, 1885, Arthur was promoted to the rank of Superintendent. With this promotion, In 1885, his salary was $1,400 annually plus $800 allowance. This salary and allowance remained the same until he eventually retired in 1903. 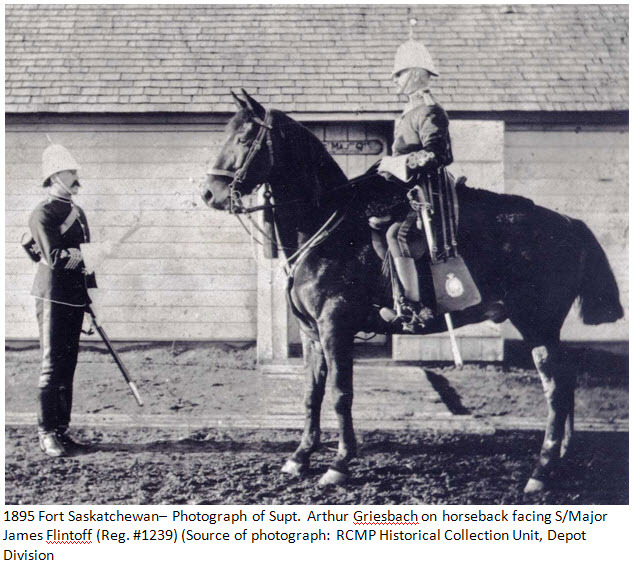 As the Officer in Charge of Fort Saskatchewan, Arthur Griesbach experienced a mutiny. 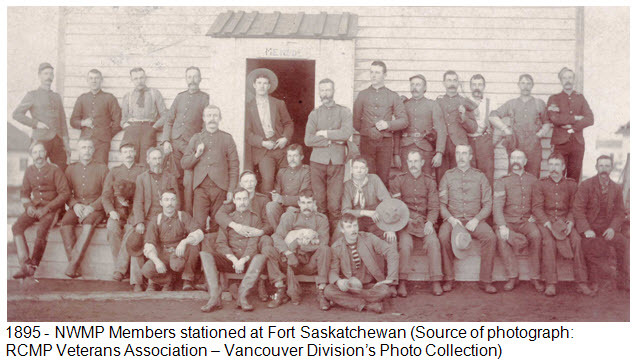 In fall of 1885, some NWMP members were temporarily housed in the old Hudson’s Bay Company fort. When there was a need to temporarily fill a vacant Corporal position – Constable William F. Carstairs (Reg. #1343) – a young recruit was appointed as the acting Corporal because the recruit had previously held the rank of a lieutenant in the Canadian Militia. Needless to say this temporary appointment didn’t go over well with most of the members. Trouble started on February 4, 1886 when three constables on night guard refused to obey orders of Acting Corporal Carstairs. Later in the evening, rebellion spread amoungst the remaining members at the fort. By late morning the following day, the mutineers were too numerous for the NCOs to control. The constables continued to perform their regular duties but refused to accept any orders or direction. One of the ringleaders – Cst. Henry Begg (Reg. #1139) arranged to have an invitation sent to Fort Saskatchewan to invite 15 constables there to join the mutineer action. Upon being advised of the situation, Supt. Griesbach agreed to meet with the malcontents and heard their complaints. Apparently, the cause of the mutiny was the promotion of six constables who were unpopular with the men. The malcontents argued that Supt. Griesbach had passed over men with longer service and more experience. Conditions in the old Hudson Bay fort were also said to have contributed to the uprising. It was reported to Supt. Griesbach that the Hudson Bay fort was overcrowded and infested with bed bugs and fleas. Apparently, Cst. Henry Begg pulled down the Union Jack flag and raised a skull and cross bone flag. Supt. Griesbach was anxious to avoid bloodshed and made no effort to arrest the ringleaders. Instead, Arthur forwarded a message off to the Commissioner in Regina and outlined the situation. Upon receiving this message, Commissioner Irvine assigned Supt. William Herchmer to immediately set out for Fort Saskatchewan with 25 members. While waiting for the arrive of Supt. Herchmer, Supt. Griesbach encouraged the mutinous members to take their horses out for a field ride which they all agreed to do. While they were out of the Fort, Griesbach encouraged the remaining loyal members to help set a trap for the returning 19 constables. When the mutinous 19 members returned, they were immediately surrounded at gun point and surrendered without incident. The primary ringleaders were arrested and placed in the Guardroom. Eighteen constables were convicted of participating in the affair and received long sentences of hard labour. c) Giving a letter to a civilian to take to Fort Saskatchewan to incite the men there to munity. Both of these ring leaders received the maximum sanction under the NWMP Act. – lost of pay for 1 month and 1 year of hard labour to be served at Depot. While serving out his time in Depot, Cst. Begg was convicted 8 times of assaulting his guards and the possession of a knife. A few months later, Begg would again charged but this time for possessing a pipe. This disruptive behavior resulted in Begg receiving additional time added to his sentence. Begg’s behavior continued to be disruptive to the point that the Commissioner Herchmer ordered that Begg be placed on bread and water while serving time in leg irons. 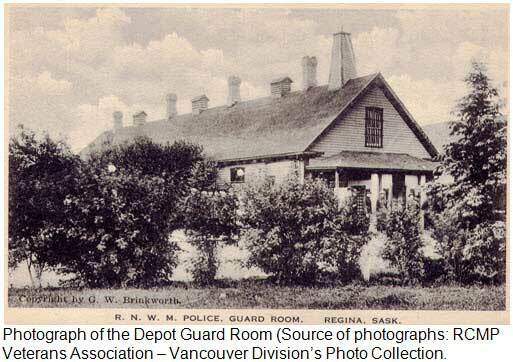 In June 3, 1887, Constable Begg completed his term of 17 months in the Depot Guardroom and was immediately thereafter discharged from the Force. Apparently, Commissioner Herchmer described Constable Begg as being a“worthless and incorrigible” individual. 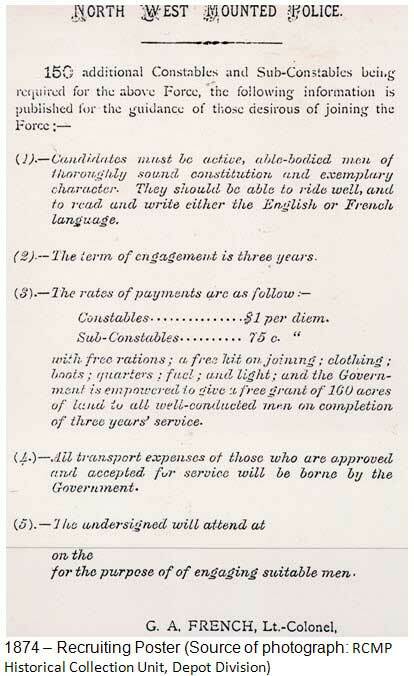 On February 9, 1903, Arthur Griesbach applied for a compulsory pension under the provisions of the new Mounted Police Pension Act. His retirement marked the completion of 35 years of dedicated service to the country. On December 1, 1903, he retired from the Force and his pension was set at $1,200 per year. Upon retiring, Arthur and his wife Emmeline moved to Edmonton and remained there until 1912. In 1912, it was decided that they would move to the milder climate on the west coast of British Columbia and settled in the community of Chemainus, B.C. On November 21, 1916, Arthur Griesbach passed away and was later buried in the family plot in Edmonton, Alberta. His wife was then entitled to a pension of $1.25 per day for the remaining days of her life. Arthur’s son William Arthur Griesbach was born on January 3, 1876 at Fort Qu’Appelle and followed his father’s military career. William ended up as Major General W.A. Griesbach OB, CMG, DSO, KC and Senator. In recognition for his dedicated service to his country and the communities he served, a street was named after him in Fort Saskatchewan.